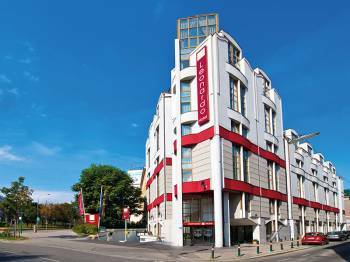 The Leonardo Hotel Vienna welcomes you in the city centre of Vienna. It is directly located at the Europaplatz, close to the biggest shopping street and 200 metres away from the train station “Westbahnhof”. Furthermore, the historic town centre and the St. Stephan’s Cathedral as well as other interesting sights are easy to reach within 5 minutes by underground.Even business travellers benefit from the ideal location of the Vienna hotel: congress, exhibition and event centres are situated in striking distance to the hotel, as well. In addition, the hotel provides 4 meeting rooms for smaller business events or business negotiations.The 213 spacious rooms and suites surprise you with a stylish design, the modern restaurant “Vitruv” indulges you with a variety of international dishes and the hotel’s own bar invites you to a delicious cocktail in the evening. As of 2015 the hotel offers its guest an own fitness room.If you would like to travel by car, 47 parking spaces are available on-site.Look forward to a journey full of hospitality, charm and a unique flair in the Leonardo Hotel Vienna. The 4 air-conditioned meeting rooms and the additional board room at Leonardo Hotel Vienna offer daylight and are named after three great Viennese composers: Franz Schubert, Arnold Schönberg and Theodor Franz Schild. Their different styles – from classical music to atonality, from Waltz to Austrian folk music – reflect the vast variety of opportunities awaiting you in our meeting rooms and the rich culture of Vienna: traditional and classic and yet also modern and innovative. All meeting rooms support daylight and are equipped with up-to-date meeting technology. The professional event team supports any planning, preparation and realisation of events.